When a member of the Brethren attacks Irene, both twins, although struggling with their own unique challenges, discover they must join together. It soon becomes apparent to the twins their only hope for survival will be to use the power of the Gifter's Ring to destroy the Brethren. In the tradition of Neil Gaiman’s bestselling novel American Gods, comes a gripping debut novel of mankind’s race to self-destruction. For Irene Cunningham, a 20th century woman struggling to make ends meet, the job at the Santa Monica DA’s office was the final chance to prove things to herself and her family as well. For her twin sister Melissa, it meant that Irene’s eventual success would bring a halt to the constant family feuds and bickering. To both twins, the tale of their families’ ancestral struggle was nothing more than a bedtime story they had heard a thousand times. But when a member of the Brethren attacks Irene both girls discover that they must trust ancient rituals which leave them questioning themselves, their spiritual beliefs, and understanding of their own existence. P.G. 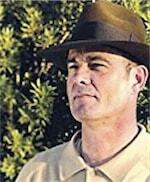 Barnett's unique and varied life experiences combined with his ability to use his inner sight, offers him a spectacular visionary portal into the psyche of the human soul. A native of Texas, he proudly drives his cowboy limousine, wears his Stetsons when he can, and continues to crank out story after story. 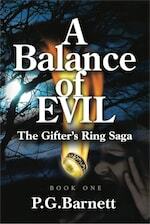 A Balance of Evil is the debut novel in The Gifter’s Ring Saga. They have been with us for eternities using their power to slip between slices of time and appear. Now there's one Master who seeks a Coven member that has the power to establish the connection again. A five year old child who holds the key to the Brethren's continued existence.